Coastal wetla nds are small but mighty. They provide habitats for a diverse array of species, improve water quality, and play a significant role in protecting coastal communities from the impacts of wave action and storms. But they also provide another valuable ecosystem service – carbon storage and sequestration. Mangroves, salt marshes, and seagrasses are increasingly being recognized as a valuable source of “blue” carbon, as they can pull carbon out of the atmosphere and store it in their biomass and soil for long periods of time. Every year, more policy and decision-makers are investing in coastal wetlands conservation as a natural climate solution to meet the greenhouse gas emission reduction commitments needed to curb climate change. However, this strategy has led to questions about whether other coastal and marine ecosystems can serve as long-term carbon sinks and whether they should be considered as parts of larger climate mitigation strategies. 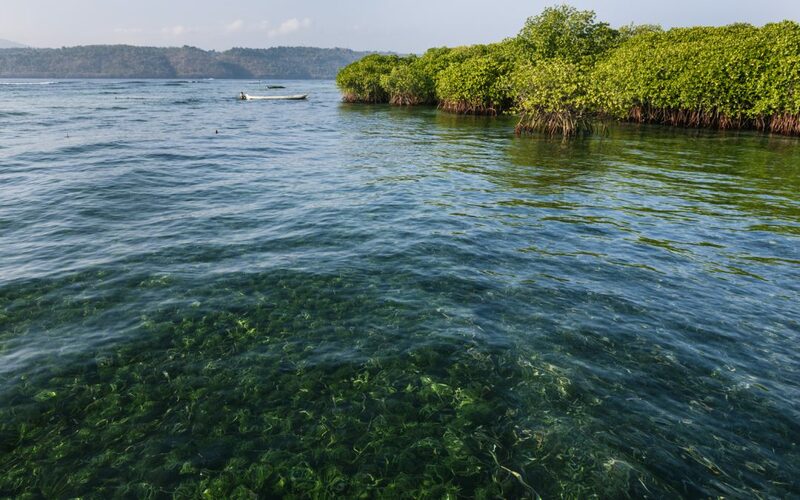 A recent article in Frontiers in Ecology and the Environment analyzes the carbon storage potential of other coastal and marine ecosystems such as coral reefs, kelp forests, phytoplankton, and marine wildlife, as they compare to coastal wetlands. The article’s authors found that although these other systems are important in the carbon cycle and are important conservation targets, they do not hold the same blue carbon power as coastal wetlands. Kelp forests and marine phytoplankton have short life cycles, limiting their potential for long-term carbon storage. During calcification, coral reefs are a source, albeit a small one, of atmospheric carbon. Some marine fauna remove carbon directly, but with limited long-term storage potential. Leveraging these ecosystems and organisms for climate change mitigation also poses a significant management challenge, particularly when it comes to phytoplankton and other marine life that spans jurisdictional boundaries. While other marine ecosystems and wildlife are valuable in providing food security, tourism benefits, habitat, and coastal protection, they do not represent the same opportunities for carbon storage and sequestration that coastal wetlands do. 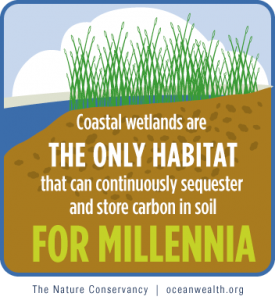 Climate change mitigation efforts should prioritize the conservation and restoration of coastal wetlands. These ecosystems represent a viable natural solution in the effort to protect our planet from the impacts of climate change. The article’s authors include scientists from University of Maryland, Conservation International, IUCN, the National Center for Atmospheric Research, the Nature Conservancy, and Restore America’s Estuaries.